Whenever I place a forever stamp with the image of the Liberty Bell on a letter or card before being mailed, I've often thought how neat it would be to admire this bell while standing in front of it. 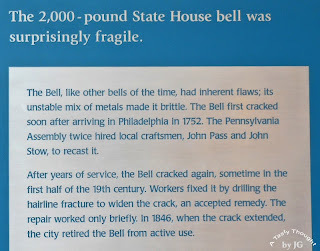 The image of our country's bell also fleets through my mind whenever I think of America's Independence. Living in MA my state's and Boston's colonial history is recalled quickly. However, the colonial history of PA and of Philadelphia is not as well known to me. This past weekend that all changed! While driving down to attend a beautiful wedding on the Jersey Shore, we stopped in Philadelphia to visit Independence National Historic Park. In 1 day we learned so much! A park map was available at the Independence Visitors Center. 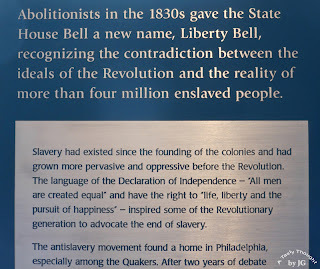 At this location we also received the free timed tickets needed to enter Independence Hall. 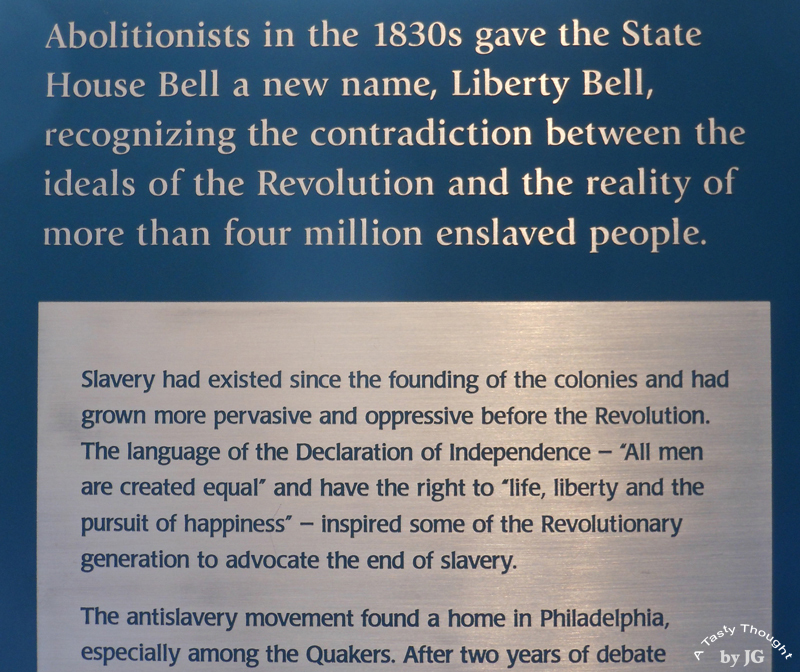 The Liberty Bell Center was our next stop! 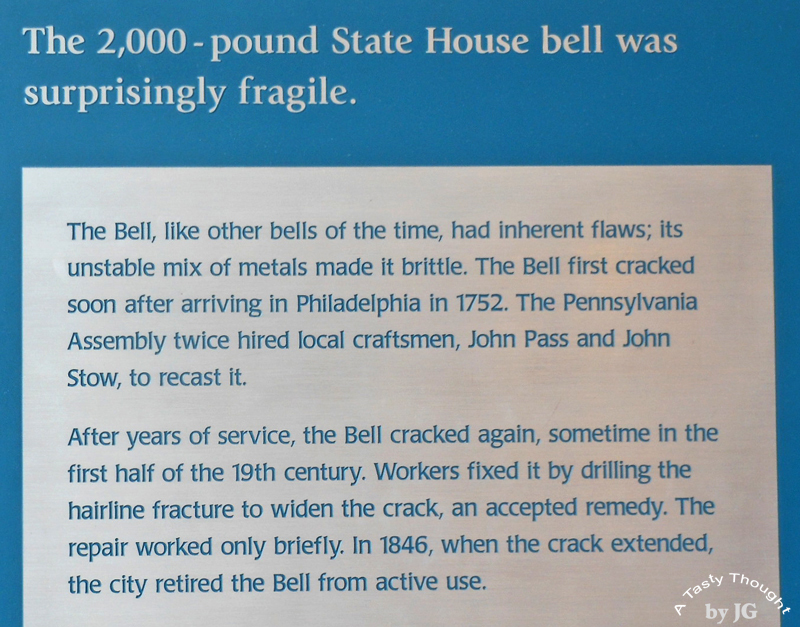 Inside, the self guided tour allowed us to read the history of the Liberty Bell. There was a great deal of fascinating history! The Park Rangers at this National Park are very eager to share their wealth of info about colonial Philadelphia and its role in our country's history. The tours of Independence Hall and of Congress Hall are great! 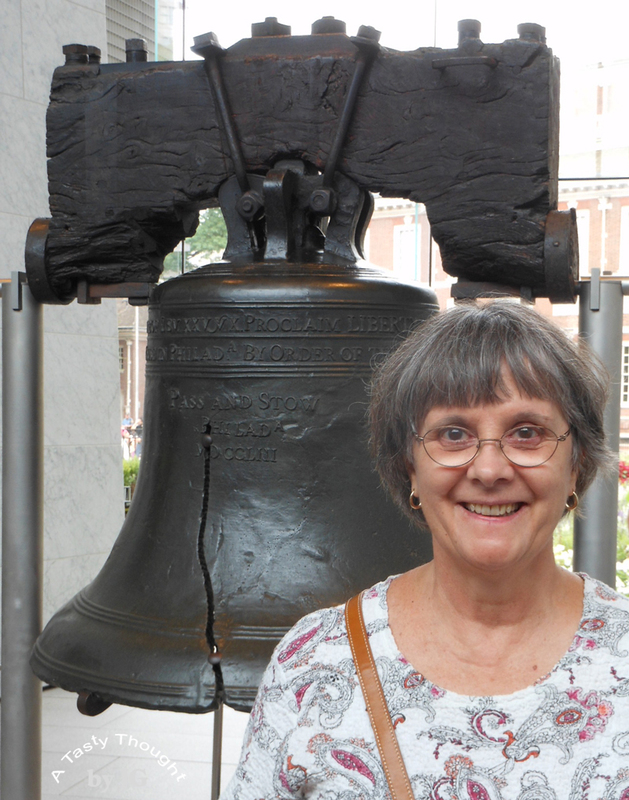 This was our opportunity to view the Liberty Bell and learn its history along with more history of our country. And that we did! This was a surprise! 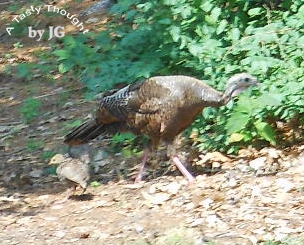 As I was placing the ingredients in my Slow Cooker this afternoon, a family of wild Turkeys passed through our backyard - Mom, Dad & the 4 kids. The first time we've seen them strolling on by. Life is just peachy! Local fruit - yum! We enjoyed fresh strawberries, then blueberries and now the locally grown peaches! With each delicious fruit, our year's supply of Freezer Jam found its place on my dining room table "doing its thing" for the 24 hour time period. Then, the Ziploc containers of Jam were placed on the top shelf in our large freezer. Fresh peaches are yummy! Peach Jam is definitely a treat! Peach Freezer Jam - so good! This jam always takes a bit more time to prepare. The peach skins are not included in the jam. After rinsing the ripe fruit under cold running water, the skins need to be removed. The easiest method to do this is to place each piece of fruit in simmering hot water for about 35 seconds. Remove from water and drain. When cool enough to handle, the skins will peel off easily (after being pierced). Then, remove the pit. Mash the fruit and then measure needed amount and place in a large bowl and continue following the directions found inside the package of Certo (liquid fruit pectin). Homemade Freezer Jam is just the best! 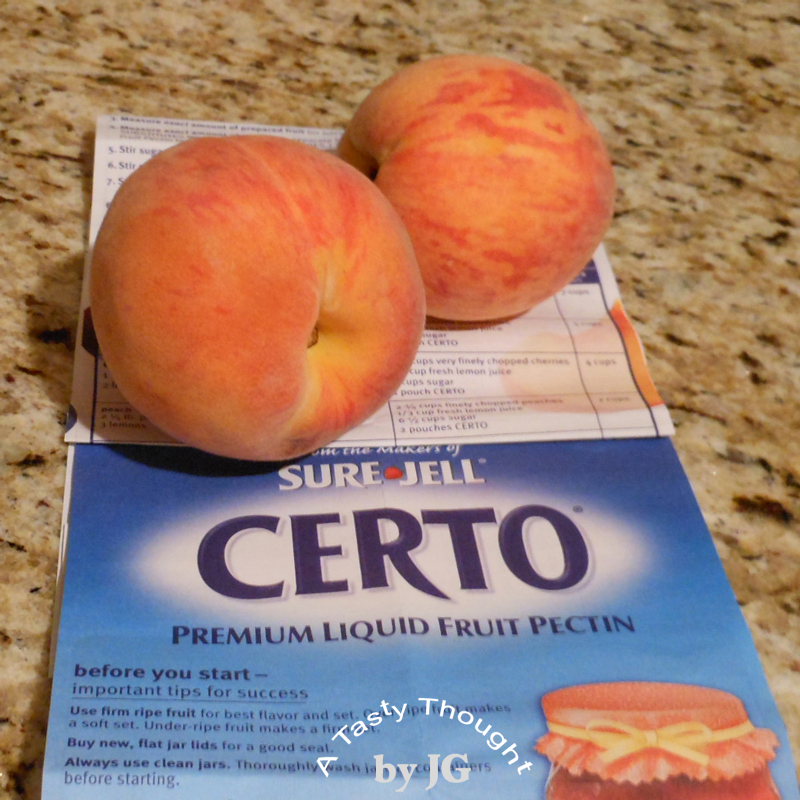 Whenever I make a batch I always read the notes that I've shared with all of you (click here for notes) and I also reread & follow the Directions (exactly) found inside a box of Certo (liquid fruit pectin). 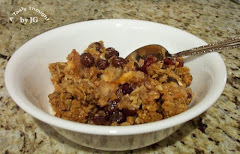 As I've shared before, in my younger years I made the cook over a hot stove in the heat of summer Jam. However, one year after reading the directions for Freezer Jam in the package of Certo, I made a batch of Strawberry Freezer Jam. It was so yummy, that I made the Blueberry Freezer Jam when the local blueberries were available. Now, it's my kind of jam! Peach Freezer Jam may take longer to prepare than the Strawberry or the Blueberry varieties, but it also tastes great - especially during the harsh cold icy winter months! Do you make Freezer Jam? 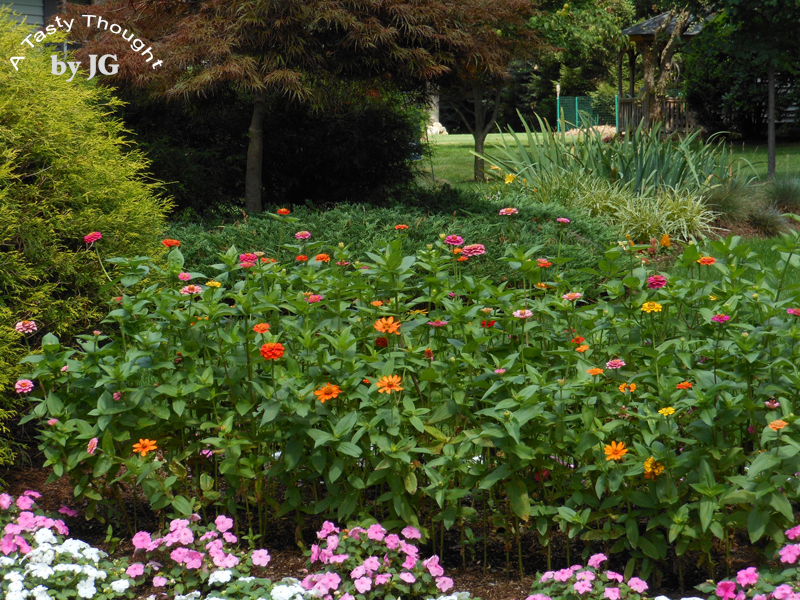 There are FuN activities to squeeze in these remaining days of summer vacation - before the school year begins! This Friday, August 16, a gem in the city of Springfield, MA the Springfield Museums has free general admission! This great opportunity for everyone is offered by the Highland Street Foundation. If you live in Western Massachusetts or will be visiting this area, stop in and visit this great complex of museums! 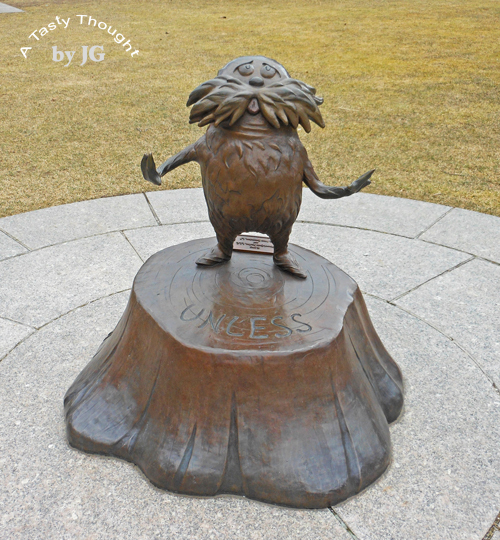 Walk onto the grounds and be greeted by a bronze sculpture of The Lorax. 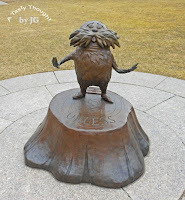 The Lorax (one of many sculptures designed by Dr. Seuss' step-daughter) stands at the corner of the Seuss Memorial Sculpture Garden - welcoming everyone. The Springfield Museums, also known as The Quadrangle, is filled with treasures. View the Japanese Samurai Warrior Suits of Armor and the beautiful Chinese Cloisonne collection in the Smith Museum, The Indian Motocycles (Motorcycles) and a Rolls Royce (that was also manufactured in Springfield) in the Museum of Springfield History. View Currier & Ives prints, Monet, Chardin, and Calder (to name a few) works of art in the Museum of Fine Arts. The Science Museum has Dinosaur Hall and many other fascinating exhibits. Stop in with your family and learn while having FuN! Click here to learn more! The Springfield Museums is one of my fave places! I volunteer at this wonderful gem during the school year giving tours. The past two days have brought cooler weather! What a change from the HHH long lasting heat wave of mid July! Yes, we are enjoying our pleasant weather! It feels like the early days of September. 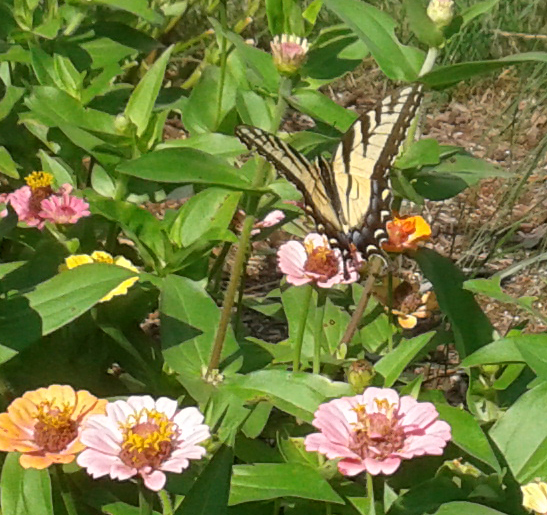 An added plus is that the Zinnias are robust! They will be blossoming until frost. 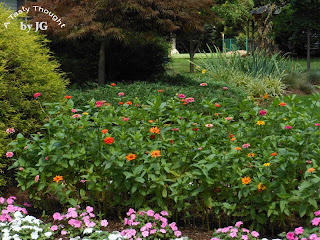 Before I know it, it will be time to save the dried seeds for next year's planting - around Memorial Day. Whenever I stop into my local Jo-Ann Fabric Store for a specific sewing notion, the vast choice of colorful seasonal whimsical fabric always catches my eye. 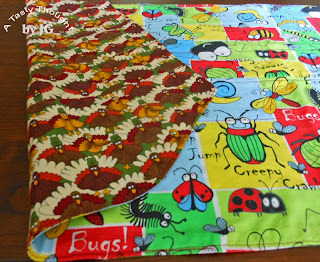 One time last summer 1 yard of comical bugs fabric on the bolt was added to my purchase. Into my stash pile it went. 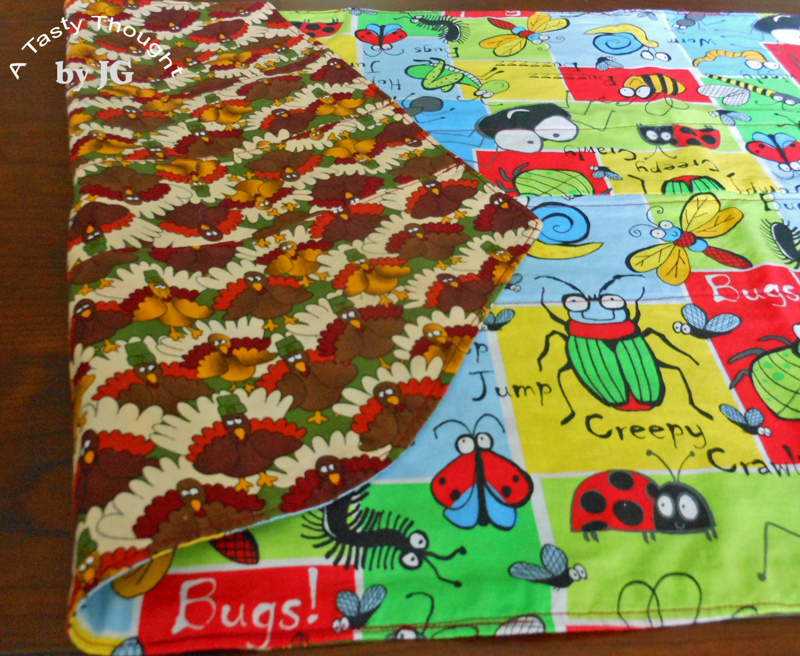 Now, the bugs fabric and also 1 yard of comical turkey fabric have been combined for a very handy table runner! Whenever our young grandsons "bring" their parents over (as our son phrases it), one of my many whimsical table runners cover our coffee table. My African Violets and other treasures find a spot on the mantle and our coffee table becomes a workstation. One must be realistic... African Violets do not rate as high as Thomas the Train and Percy or Duplos do...to a toddler. Last Saturday "the bugs" table runner covered our coffee table. During Thanksgiving time, the flip side of "comical turkeys" will be used! The pattern for a table runner was simple to make. It was made to order. Newspaper, scissors, a tape measure and scotch/ masking tape was used. My Janome was ready! Now, I use the newspaper pattern over & over again whenever I sew another whimsical table runner. Subtract 1 and 1/2 inches on each side. Make pattern from old newspaper using those dimensions. Fold newspaper pattern in half lengthwise. Fold in half, again. There will be 4 quarters. Place paper pattern on table and re-size, if needed. Cut two pieces from desired fabric. *I always wash/dry fabric first. Turn right side out and press. Also press raw edges of opening in, to get ready to finish off. For extra body, I mark/ pin & topstitch 3" from edges on all sides. Optional: Topstitch again 2" or 3" from first topstitching. 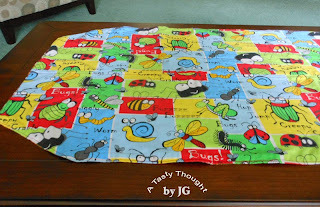 ***With the Bugs/Turkeys Table Runner, I wanted the comical characters to be visible to the little guys on the two long sides of the coffee table - it would always be facing them. For that reason, I cut the 1 yard of fabric in half and then sewed the two halves together, with the 2 halves facing opposite directions. Other wise, it would be upside down on one side of the coffee table, if left as one large piece. This was done before Step 8. I prepared the turkeys fabric in the same way before cutting the pattern out. Now, I'm back to working on my Envelope Pillows! 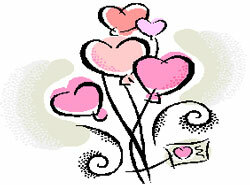 Do you enjoy sewing for special occasions? My Janome has been humming!